Put 1 cup water into a glass pitcher and bring to a boil in the microwave. Add and mix 1 cup sugar to the hot water until dissolved. Add 3 cups cold water and mix again. Unused syrup can be stored in the refrigerator for up to two weeks. Experts say do NOT add red food coloring. Hummingbirds will find your feeder regardless of the syrup color or type of feeder. 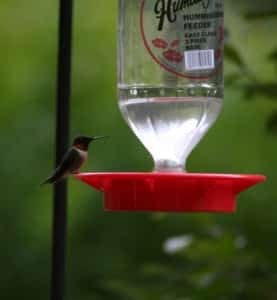 The most important feature of a hummingbird feeder is fresh food! Be prepared to change the nectar regularly. We find that this is not an issue during fall migration – our feeders are emptied nearly daily! Hang your feeders where you can easily view them. Our guests love to sit on the front porch of our Hot Springs Arkansas bed and breakfast and watch these little guys zoom overhead! This entry was posted in bird watching, recipes by admin. Bookmark the permalink.